All of us depend on plants, without them life as we know it would cease to exist. So it’s essential to the future survival of all species that we make informed decisions about the way we manage the environment and conserve the biodiversity of plant life. That’s why the Australian PlantBank at the Australian Botanic Garden, Mount Annan is so important – it’s an investment in plant conservation for future generations. The Australian PlantBank’s ultimate goal is to collect, store and study seeds and live tissue specimens of all plant species in Australia. Australians are the stewards of one the most biodiverse countries on the planet – our 25,000 plant species ranking us fifth in the world for our flora mega diversity. Estimates suggest 85 per cent of our flora is found nowhere else on the planet! Globally, Australia is home to 14 per cent of threatened plant species and almost a quarter are considered to be in danger of extinction. Sadly, eleven per cent of New South Wales’ 5,800 species are listed as threatened. How are seeds and plant material stored? Seeds are stored under various conditions in the Australian PlantBank. Vacuum sealed aluminium foil seed packets are housed in walk-in thermally insulated coldrooms which keep the seeds at 2º to 4ºC for short-term requirements and 18º to 20ºC for long-term storage. An amazing feature of PlantBank’s technology is its capacity to store small sections of plant tissue in liquid nitrogen, which freezes a plant’s tissue between minus 180º and minus 196ºC. This process, called cryopreservation, suspends a plant’s metabolism and greatly increases the length of time a specimen can be stored, alleviating the problem for species which do not produce seed or produce seed that cannot be easily stored. The Australian PlantBank is a learning centre for everyone, providing an immersive experience for the general public and school students alike. Visitors can participate in organised education tours and multi-media learning activities or take self-guided tours. Learning is made easy with the ClimateWatch trail app (created by EarthWatch), a ‘living laboratory’ which links domesticated plants growing in the garden beds around PlantBank to their wild relatives and the work done inside the PlantBank laboratories and nursery. School education programs allow students to participate in hands-on germination projects and gain insight into plant conservation and biology, seed collection, preservation and propagation. They can also visit the laboratories, the seed vault, the ‘living laboratory’ garden beds and the endangered Cumberland Plain Woodland to learn about how PlantBank’s research is critical for plant conservation in Australia. Inside PlantBank there’s the mini museum of intrigues – the Diversity Wall – where over 200 interactive elements engage visitors in the world of plants and their ecological importance and how plants are used for economic and ethno-botanical purposes. Some items on display date back to the origins of botany in Australia; and you can discover the history of tea, first grown thousands of years ago in China. In the 18th Century tea was more valuable than gold! 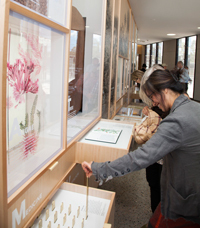 Visitors can also learn about the pharmaceutical uses of plants at PlantBank. Did you know that Aboriginal people used sap from eucalyptus trees to plug holes in their teeth? They also used the native corkwood tree to ease stomach complaints – the same ingredient is now found in modern pharmaceuticals! A visit to PlantBank will engage your senses as you explore this important plant research and conservation centre at the Australian Botanic Garden at Mount Annan in Sydney’s west. Public Engagement, Royal Botanic Gardens and Domain Trust.